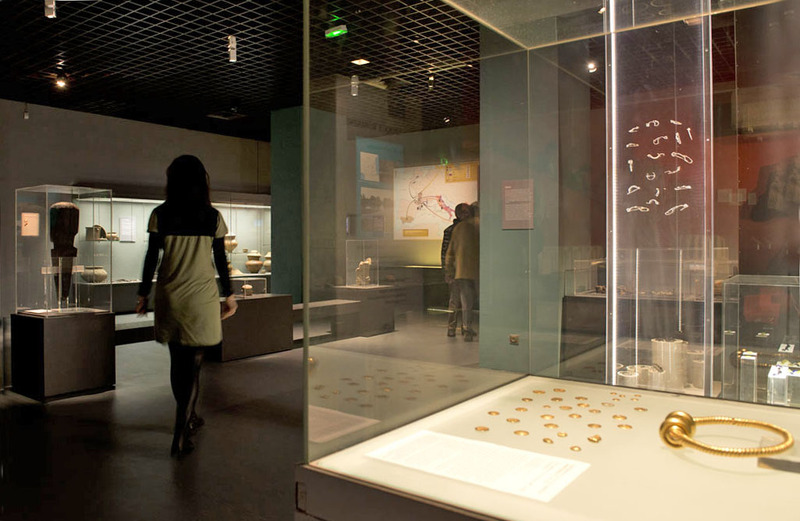 Twenty-five years after moving into the former Faculty of Arts of Bordeaux University, in 2013 the Musée d’Aquitaine undertook a complete renovation of the rooms that housed the Prehistory and Protohistory collections. This is a new scenographic layout covering 530 m², enhanced with models, reconstructions and videos. In this video film produced by Station Ausone in July 2013, Vincent Mistrot, Head of the Prehistory-Protohistory department at the Musée d’Aquitaine, presents the Prehistory and Protohistory rooms. The focus is on the Venus de Laussel (called the "Venus with horn") and the Gallic treasure of Tayac, two key exhibits in the museum’s collection. The Prehistory rooms present the last 500,000 years of Aquitaine’s past. There are several thousand flints, bones, works of art made from stone or bone, jewellery and bronze objects, which show the evolution of the different human cultures from the first traces of Man in Aquitaine to the advent of metalworking. This room starts with a presentation of the prehistoric site of Laussel (Marquay, Dordogne) and the famous "Venus with Horn" which dates back 25,000 years. Nearby, some typical tools are exhibited: hand axes, spearheads and bone needles. Other areas are devoted to stone-cutting, working with bone, rock art (facsimile of the “frieze of stags” from the Lascaux cave) and fire-making. Bison, reindeer and horses can be clearly seen on the works of art from the splendid collection of engraved bones from Abri du Morin (Pessac sur Dordogne, Gironde) and the sculpted blocks from Cap Blanc and Laussel (Marquay, Dordogne). The Pair-non-Pair site (Prignac-et-Marcamps, Gironde) is shown, the only real decorated cave in Gironde, discovered in 1881 by François Daleau: tools from the everyday life of prehistoric man, paint palettes on a pebble or scapula, adornments made from pierced teeth, a flute made from bird bone, etc. This room is devoted to the Neolithic period and the Bronze Age, between 5200 and 800 BC where the most typical object is the axe, first made from polished flint and then bronze. This period saw the emergence of agriculture and livestock breeding in Aquitaine, with the development of pottery for the storage of food. Storage jars, cups and bowls are shown near the reconstruction of a kiln. Populations became sedentary in the first villages (models of houses). This is also the time when dolmens, collective graves and burial caves appeared. Around 1800 BC, at the start of the Bronze Age, man developed tools and weapons such as swords and spears. This wealth of resources then led to a new phenomenon, that of votive offerings and offerings to the gods (Saint-Germain d'Esteuil, Gironde).